Although there are many types of clouds, they are all made of the same thing - water vapor and/or ice. That vapor is tiny droplets of water that are suspended in air. The droplets in clouds congregate (group together) because of different factors in the atmosphere. Those congregations are called clouds. You will often find clouds in areas between high and low pressure systems. These cloud types are usually associated with different weather patterns and can occur in any climate. Remember, weather is specific and climate is a long-term pattern for a region. Of the possible cloud types, we'll start with stratus clouds. They are found in the lower layers of the atmosphere and span many miles. They are usually grey in color because they carry more water. They also appear flat (compared to other cloud types). Cirrus clouds are the ones way up in the sky. They might be found at over 10,000 feet in the atmosphere. They are the wispy white clouds flying along the upper layers of the atmosphere. Because they are so high and the temperature is colder they are often made up of tiny pieces and particles of ice. 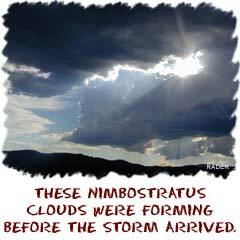 The words are getting bigger as we look at nimbostratus clouds. These are the storm clouds, big, dark, and you might get that feeling that it's about to rain any second. Cumulus clouds are the classic clouds - big, puffy, and white. They are like cotton balls in the mid-altitudes of the atmosphere. As they get larger, you will notice they have a flatter base and are poofier on the top. Yes, 'poofy' is a scientific term. When they are small, they are just cotton balls in the sky. 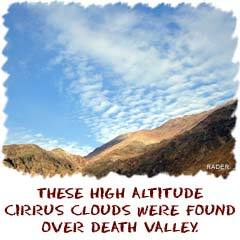 There are other types of clouds and terms used to describe them. There are thunder clouds and dust clouds. You should also think of fog as a cloud. It is a cloud on the ground but created in ways different from the clouds in the atmosphere. Once you study the basic clouds types, you will begin to understand that most of the cloud formations you see are combinations of many types of clouds. Cloud formations become extremely complex before and after storms and extreme weather conditions.